This is my first review so hope it comes out ok .. and please forgive the spelling and grammar as I read books I don't compose or write to any great degree of skill. I have been playing poker for some 35 years now and have played every where from the kitchen table,and in dark back rooms of bars, to Casinos , and online. So I figure I know the game well enough to comment on this book somewhat. I am a big fan.... ( much to the chagrin of my poker buddies ) of Phil Hellmuth and his style of play. 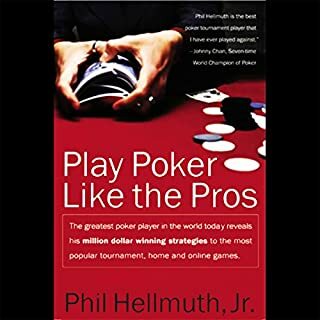 I found this book to be easy to follow and interesting from the standpoint of that, I am a fan of phils and interested in how he approaches the game . With that said , I found the theory and strategies he relayed in the book to be very basic and nothing new to an experianced player and was geared to the novice player. So if you are an experianced player and not a fan of phils I would pass .. But if you are new to the game and looking to learn some basic strategies and plays then this is a good choice for you.